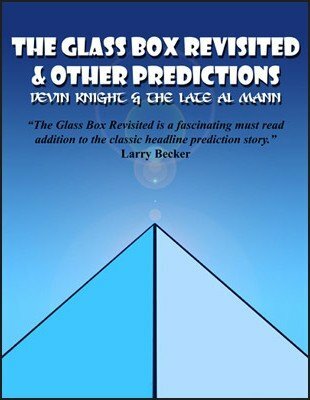 If you already own The Glass Box Prediction PDF this expanded version will only cost you $25 instead of $40.00. This is the Glass Box Prediction on steroids! New and exciting techniques that take the original glass box far beyond anything you imagined possible. Almost double the size of the first release with new material that has NEVER appeared in print. Positively the most impossible headline prediction ever created. These new techniques will convince your audience you have the ability to see the future. You give a VIP (very important person) a clear plastic box containing three predictions weeks in advance. The three predictions are plainly seen inside the box. YOU NEVER TOUCH THE BOX AGAIN. On the day of your show, the VIP brings the box to your show and opens it in full view of the audience. He takes out the predictions and reads them aloud before you even touch them. You have correctly predicted the headlines under the most impossible conditions imaginable. NEW INFORMATION THAT DEVIN HELD BACK IN THE FIRST RELEASE NOW REVEALED! These ideas are not limited to just the Glass Box, you can apply many of these ideas to almost any headline prediction you may currently be using. Ways to let the VIP apparently read the predictions and SIGN them before they are sealed in the box. In fact, he can actually quote to the audience what the predictions are BEFORE the box is opened proving he read them in advance. HE IS NOT A STOOGE. How to apparently make a wrong prediction, yet it comes true the next day after the show! This will convince the world you can really predict the future. The Radio Interview Secret. You verbally quote on a radio show earlier in the week what you predicted and sealed in the box. On the day of the show those events are the current headlines in the paper. This will convince hard-core skeptics you might be for real. An excerpt from the radio show can be played during your show so the audience can hear the verbal prediction made earlier in the week. Proven ways to have the audience think you are a celebrity before you even come on stage. This technique alone will make your show go better. Techniques that let you predict things after the fact. How to prove you have predicted every major disaster that happened in the last few years. Not just verbal claims, but concrete proof. This will enhance your reputation as a mentalist and person who sees the future. How to keep diaries that prove to reporters your long list of predictions. This is a new secret and is revealed for the first time. How to apparently change the future and stop bad things from happening you have foreseen! A proven method that Devin used and received a two-minute standing ovation for. You offer concrete proof that you changed the future, proof that will stand up to most ardent investigations by skeptical reporters. Sure-fire ways to get thousands of dollars worth of free advertising on local television stations during prime time. Proven techniques to make yourself famous and double your show fees because of your fame. BONUS: The 1985 Ultimate Prediction. This is the exact method used by Devin Knight in 1985. He used this method to achieve world-wide fame with articles in over 2000 newspapers after predicting the Newfoundland plane crash. Your prediction is written in full view of the VIP and media. The VIP signs and dates your headline predictions. The predictions are sealed in an envelope which both the VIP and media members sign their names on to prevent a switch. On the day of the show, the VIP opens the envelope and reads the predictions. You are 100% correct. No switch of the envelope, in fact you never touch it even secretly after it is sealed and given to the VIP. Only one headline prediction slip. It is not switched. You touch nothing ever, while on stage and I mean nothing, not even secretly. No preshow work with the VIP. He brings the envelope to the show, opens it and reads the prediction slip he signed 30 days ago. No gimmicks, no carbons, just the envelope and predictions. There is only one envelope used period. Again no switches of any kind! Everything can be left for examination. 1st edition 2009; 53 pages.